Anyone even remotely familiar with Egyptian history knows about King Tut. This famous pharaoh was one of the first mummies discovered in the Valley of the Kings in Egypt. His story spread along with rumors that opening his tomb came with a terrible curse. 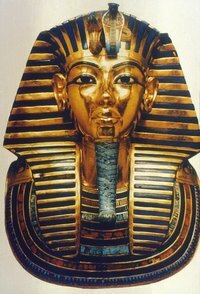 Today, King Tutankhamen’s death mask is an almost universal symbol for ancient Egypt. If you love Egyptian history, or your child is a budding archaeologist, try re-creating his death mask as part of an original costume or as wall art. Cut a piece of screening mesh about 3 feet long and 8 inches wide using scissors. Spread it out horizontally on your work surface. Look for craft screening mesh at craft stores; it’s easily malleable and offers a 3D molding medium for papier-mâché. Place a plain white costume mask on the center of the mesh so the top of the mask overlaps the mesh by about 4 inches. Long wings of screen should stretch out on either side of the mask. Fold over 1 inch of the top, long side of the mesh. Bring that fold down over the forehead of the mask. Press the second fold down sharply so it stays in place. Grip the right, short end of the mesh, and fold it to the left and down, bringing the long top edge of the mesh parallel to the mask’s right cheek. Repeat on the left side of the mask. This step completes the shape for King Tut’s headdress. Flip over the entire assembly. You should see a flat piece of mesh spanning the back of the mask. Cut away this mesh in a U-shaped pattern, leaving about an inch of excess mesh around the edges of the mask. Glue the excess mesh to the inside of the mask with hot glue. Let it dry 10 minutes. Cut a 3-by-5-inch piece of mesh, and hot glue it to the mask’s chin, forming the mesh into a loose cylinder. This piece will serve as the pharaoh’s beard. Mix 2 cups of warm water with 3 cups of white school glue in a small bowl. Dip 1/2-by-4-inch strips of newspaper into the mixture, squeezing off the excess between your fingers. Lay the newspaper pieces on the face first, smoothing them over the planes of the mask. Cover the eyeholes with the newspaper. Cover the mesh headpiece with newspaper strips, wrapping and smoothing them over the 3D folds. Once you have fully covered the mask, allow the papier-mâché to dry for 24 hours. Spray paint the entire mask white. Let the paint dry for 2 hours, then spray paint the mask gold. Allow the gold paint to cure overnight. Paint the pharaoh’s eyes white with black around the edges with paintbrushes. Paint back Xs along the length of the beard, and paint blue, horizontal stripes all over the headdress. Let all the paint dry overnight.